The new P9 (presentation mode) and D9 (demand mode) feeders from Straight Shooter are the latest innovations from the company that brought you buckle separation, straight feeding and 5-minute belt changes. Responding to requests to put Straight Shooter ideas into a model for swing arm inserting equipment, they developed two all new 9” (width) capacity models! The P9 (presentation mode) feeder fits in the feed station of a normal swing arm type inserting machine to replace the standard vacuum feeder. The P9 incorporates unique paper guides that guide the document all the way to the gripper and their built-in product detect is attached to the guides so that a separate adjustment of this eye is not necessary! Utilizing beam-break technology the photo eye is not sensitive to dark printing on the document as is the case with competitive feeders! In addition, it’s built-in paper hold down guides present the document at the right height for the gripper. 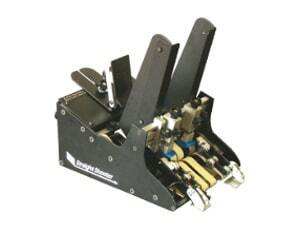 There is no need to add additional components to the inserter for paper guiding. The P9 can be conveniently set up away from the hopper and then simply slid into position. It can even be moved from one hopper to another with no adjustments! The D9 (Demand mode) feeder adds capacity to any type of inserter. The D9 can be placed on the front table of a swing arm inserter and eject a piece into the insert track when signaled by the included start photo eye. Not only can the D9 easily increase your inserter capacity, it can also handle hard to feed items such as Z-folded pieces, booklets, magnets, CD’s and more! The D9 incorporates our unique acceleration section that creates consistent gaps between pieces and accelerates each piece away from the feeder for excellent delivery to an inserter or collator type machine. Complete paper guides that control the document all the way through the feeder. Four repositionable feed belts and acceleration belts – easily adjustable for wider range of pieces! Dual, independently adjustable separators for versatility. – Feeds uneven pieces easily! Handles piece sizes from business cards to 9” wide, from 2” to 12” long.